Last week, Zane Benefits President Rick Lindquist and BambooHR CEO Ben Peterson discussed "How to Become a Small Business HR Hero" via webcast. The feedback has been outstanding, so we've made a recording available to everyone. During the webinar, Lindquist and Peterson discuss key factors of a stand-out human resources program including: recruiting great talent, motivating employees to go the extra mile, onboarding to retain talent, and offering valuable compensation and benefits. 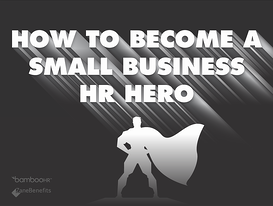 Small business owners, office managers, and HR professionals are invited to download the 60-minute on-demand webinar to learn how to take employee management practices to the next level and become a small business HR hero. Download the On-Demand Webinar Now!